FEATURE — Chef Alfredo’s Ristorante Italiano prides itself providing a fine dining experience wherein its customers can enjoy a variety of authentic Italian dishes. The upscale restaurant was founded by Alfredo Modica, a native of Sicily, Italy, whose five decades of food preparation experience included 30 years as a chef for the Princess Cruises cruise ship line. In 2011, Modica set up shop in Utah, opening Piccolo Mundo in St. George with Gerardo Reyes. In December 2013, Chef Alfredo’s in Cedar City opened, with the St. George Chef Alfredo’s opening the following October. In the summer of 2018, Modica retired, leaving Reyes in charge of overseeing both locations. Watch Sheldon and Amber’s visit to Chef Alfredo’s in Episode 28 of “What’s on the Menu” in player above. The Cedar City location is the larger of the two locations, seating up to 120 people, including up to 30 in its banquet room, which can be reserved for parties and gatherings. Chef Alfredo said he wants to the food to speak for itself. He’s like, “I have great food. I’m going to hire people who are going to (provide) great service, and we want to give them a beautiful, Italian-looking atmosphere.” So we want to hit those three main components. Although both Chef Alfredo’s restaurants have similar offerings, their slightly different menus are listed separately on the company’s website. Both locations also offer full catering services. Various pasta dishes, including fettuccine, rigatoni, ravioli and spaghetti. Several chicken options, including the ever-popular chicken parmesan and pollo marsala, a sautéed chicken breast topped with fresh mushrooms, shallots and marsala wine sauce. A similar dish, vitello marsala, features veal instead of chicken. Baked lasagna featuring layers of pasta with meat sauce, ricotta, mozzarella and parmesan cheese. Other meat entrees, including filet mignon beef steak and several seafood and pasta dishes. Chef Alfredo’s also has several specialty appetizers available, along with soups, salads and desserts. The beverage menu includes a range of imported wines and beers. Ortega says the food at Chef Alfredo’s is carefully prepared with the overall goal of achieving an ideal balance. Ortega compared cooking for Chef Alfredo’s to a chemistry project. And when it comes to ambiance, if they’re lucky, diners at the St. George restaurant might catch local high school student Derek Coombs playing jazz and contemporary music on the piano on certain nights. What’s on the Menu: Chef Alfredo’s | Brought to you by Camping World. 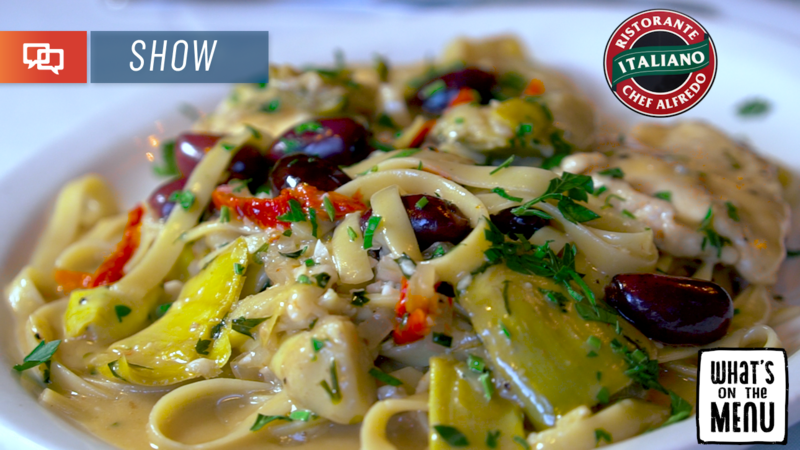 Chef Alfredo’s | Website | Facebook pages: (St. George and Cedar City) | Locations: 76 W. Tabernacle St., St. George (click for map) and 2313 W. state Route 56, Cedar City (click for map) | Hours: Both locations are open for dinner nightly from 4 to 9 p.m., Monday through Saturday. The St. George location is closed Sundays, while the Cedar City location is open from 4-8 p.m. on Sundays. The Cedar City location is also open for lunch on weekdays (Monday through Friday) from 11 a.m. to 2 p.m. Call for reservations. | Telephone: 435-656-5000 (St. George) and 435-586-2693 (Cedar City). How much can Chef Alfredo move around? This is the fourth location I know about in a short time.